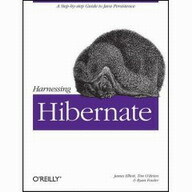 Présentation du livre "Harnessing Hibernate" (O'Reilly) de James Elliott, Timothy M. O'Brien, Ryan Fowler. Once you're past the first few chapters, you can jump to topics that you find particularly interesting or relevant. All background material and explanations of how Hibernate works and why is in the service of a focused task. Source code can be downloaded from the book's website. If using SQL is an uncomfortable chore, Harnessing Hibernate offers you an effective and trouble-free method for working with the information you store in your applications. Commandez sur www.amazon.fr : 22,57 EUR TTC seulement !!! Copyright © 2007-2009 . Aucune reproduction, même partielle, ne peut être faite de ce site ni de l'ensemble de son contenu : textes, documents, images, etc. sans l'autorisation expresse de l'auteur. Sinon vous encourez selon la loi jusqu'à trois ans de prison et jusqu'à 300 000 € de dommages et intérêts.